An Air Force captain and former Christian chaplain who later converted to Judaism claims that he was discriminated against and subject to harassment over his decision to become a Jew. Capitan Jeffrey Montanari has served in the military in various capacities since graduating officer’s school in 2010 and training as a chaplain under the auspices of an Evangelical group known as the International Church of the Foursquare Gospel. During the time of his service, he was decorated several times and recognized for his contributions to the spiritual lives of his fellow servicemen. Over a period of several years, after engaging in missionary activities and efforts to procure kosher food for Jewish servicemen, as well as his discovery of a line of Jewish ancestry, Capitan Montanari developed an interest in Judaism and eventually began the process of conversion, a move that he claims began a downward spiral in his Air Force career. Upon completing the conversion process and a new training course, his application to serve as a Jewish chaplain was rejected, a move he claims was made on discriminatory grounds. 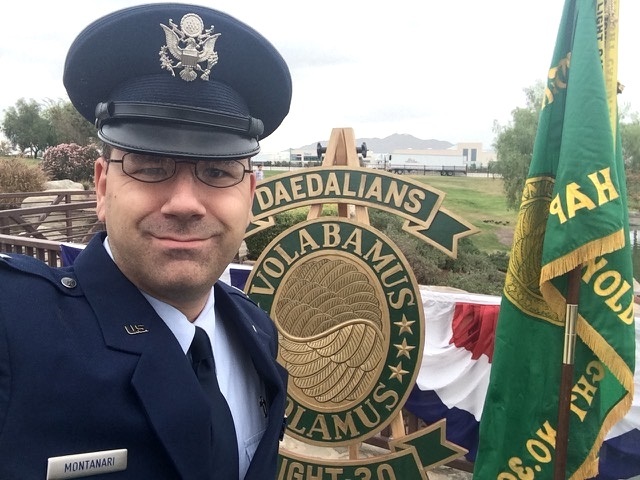 Now, the First Liberty Institute, a law firm focusing on religious liberty interests, has sent a letter to several high-ranking Air Force chaplains detailing Captain Montanari’s claims and threating legal action if they are not addressed. “As you can imagine, he [Captain Montanari] was going through a long process of introspection and wrestling with discovering his identity as an Orthodox Jew. To be experiencing hostility in the workplace based on his new religious beliefs made it all the more difficult,” Michael Berry, First Liberty’s deputy general counsel and director of military affairs, told Hamodia. In 2015, Capitan Montanari had been assigned to the March Reserve Base in Riverside County California. Given his changes in belief, he felt he could no longer continue to serve in good faith as a Christian chaplain and began the process of transferring to become a line officer, wishing to continue working as a technician on the base. At that point, he ran afoul of his unit’s new wing vice commander, Colonel Keith Y. Ward, who refused to accommodate Captain Montanari’s request and ordered him to continue serving as a chaplain on behalf of Foursquare. Furthermore, Captain Montanari was demoted to a “temporary technician,” despite having voiced the desire to continue serving in his capacity in the Inspector General’s Office, where he could avoid further religious conflict. Col. Ward explained both of his decisions by telling Capitan Montanari that “G-d told me that you are not the person for the [Indefinite Inspector General] job, and I am at peace with that.” The colonel later voiced regret for his choice of words and was “counseled” by a base official regarding the incident. As a result of what he viewed as “substantial burdens on his religious beliefs and Col. Ward’s refusal to provide a religious accommodation,” Captain Montanari decided to give up his commission in the service. After completing his conversion process, Captain Montanari enrolled in Pirchei Shoshanim, an on-line self-described “worldwide Shulchan Aruch learning program” that offers “ecclesiastical endorsements” for military chaplaincy. Upon finishing the course, he re-applied to the Air Force to serve as a Jewish chaplain. At his interview, Captain Montanari claims he was subjected to “hostile and lengthy questions about his conversion,” only to receive a formal letter of rejection in January of this year. “The Air Force has a shortage of Orthodox Jewish chaplains and it’s a community that is underrepresented in the military; [by rejecting the application] they are not only doing Chaplain Montanari a disservice, but a disservice to their own airmen as well,” said Mr. Berry. He went on to say that the facts point to discrimination as the cause of his client’s denial. In response to a query from Hamodia, the Civil Air Patrol [CAP], which handled the re-application, denied that Captain Montanari’s change of religion or source of endorsement was the reason for his rejection. “The denial of this applicant’s request to a CAP Chaplaincy is totally extraneous or non-related to Rabbi Montanari’s conversion to Orthodox Judaism or his new endorsement,” said spokeswoman Julie Debardelaben. Mr. Berry said that the Air Force confirmed receipt of First Liberty’s letter, but has yet to receive a response of any sort.